Last night's results were a little more kind to us than Tuesday's. Manchester City dropped points with a 2-2 draw with Birmingham at St Andrews. However the result at Ewood Park went against us as Blackburn lost 0-1 to Tottenham. It leaves us three points ahead of City who have played a game more. While our north London neighbours are eight points adrift of our position. The table show's we're in a good position. Manchester United have a five point advantage but there away record is poor. Three wins in the league this season raises the question about their durability. Can they go the season unbeaten? Possibly. But I would guess they won't because they have several tough away fixtures which includes trips to the Grove and Stamford Bridge. "It looks like we're the last challengers. We've got more points than Manchester City, Chelsea and the others. "They can still come back strongly but we can challenge United. We need to focus on our games, keep winning and collecting points. Then, maybe, they'll lose at some point. "It's not going to be easy but we've big faith in ourselves and the squad. And we do believe we can do it so bring it on." The Frenchman has grown into his role alongside Johan Djourou and they make quite a pairing. Koscielny preferring to attack the ball whilst Djourou sweeps up behind. And it's worked so far this term. Whilst Koscielny is right about the challenge we face in clawing back those five points which separates us and United, it's not unobtainable. We have to continue our good run with a victory against Newcastle on Saturday and hope for some sort of result at Molineux in the late kick off. 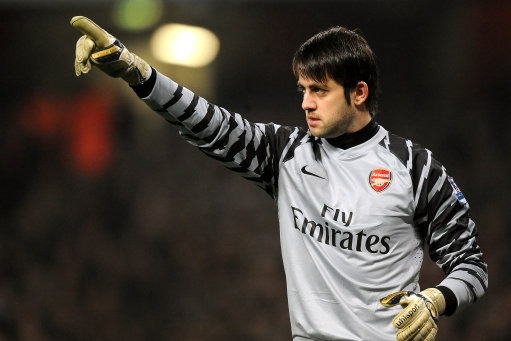 Elsewhere there is worrying news about the injury to Lukasz Fabianski which is set to require him to under go surgery on his shoulder. It may well keep him out for the rest of the season. "The doctors expect me to take a long break. But we'll see if that will happen." Lets hope it's not as serious as feared, but it doesn't look good. There is more rubbish around about Cesc Fabregas' so called "disgusting" comments which he was supposed to have made in the tunnel on Tuesday night. The captain himself has come out and given his side of the story with some comments made to the official site. There are some "thought pieces" on the Daily Mail and Guardian sites which don't seem to have been given much thought at all. The comments though are great. The manager will host his pre-match press conference later. Expect news on the injury to Fabianski plus an update on whether there is a chance that Alex Song and Theo Walcott might travel to St James Park.